WESTON LAKES - The Fulshear/Simonton areas have a brand new service organization. 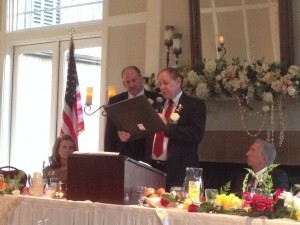 The Rotary Club of Brazos River held its charter ceremony and gala on Saturday, June 21. The event saw members from nearly a dozen of District 5890's chapters. District Governor Bob Gebhard and his wife, Dianne, were in attendance to present the chapter to charter to newly installed club president Charlie Myer. Other VIP Rotarians included Governor Elect Lisa Faith Massey and District Governor Nominee Elect John Liu and wife, Sandy. Also, there were several Past District Governors in attendance to see a new club chartered and to celebrate the evening with the charter members.